Hey, I’m not a doctor, you might be thinking. Why does anyone care if I wash my hands? Manners aside, handwashing is the thin soapy line between you, me and Germtown. 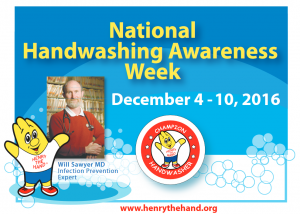 December 4 – 10, 2016 is National Handwashing Awareness Week, and though that may seem like the most unnecessary awareness campaign ever, studies show a horrifying epidemic of dirty hands. Clean hands save lives, and the CDC says that ‘handwashing is a win for everyone, except the germs.’ Caregivers and home care aides need to know the facts and stats about the importance of handwashing, so that loved ones don’t shake hands with germs. If you don’t have access to soap and running water, hand sanitizer is a great option. But the CDC wants you to know that effective hand sanitizer has at least 60% alcohol, can’t handle a thick layer of dirt or grease as well as soap, and must be applied thoroughly to the front, back and fingers of your hands, then rubbed until dry. Hand sanitizer isn’t a replacement for soap and water, but can keep you germ-free in a pinch. Still not convinced we need to raise awareness of the importance of handwashing? Only 66% percent of Americans wash their hands after using the bathroom, and 70% of those confess they often skip the soap. Which means that 34% of the people around you didn’t wash their hands after they last went to the bathroom. Uh, disgusting. And Americans aren’t the only dirty birds: a European company’s survey showed that 62% of European men don’t wash their hands before leaving the bathroom, while 40% of European women bypass the sink. Plus, damp hands are 1000 times more likely to spread germs than dry hands, so the perfunctory splash and air dry isn’t doing you any good: wash the right way or don’t bother. Grossed out yet? The bathroom isn’t even the hottest hot spot. The average office worker’s hands touch 10 million bacteria a day – we’re looking at you, subway car pole. And those germs get spread around to surfaces outside the bathroom, surfaces that you are touching: the microwave in the kitchen, the copier, the elevator, the vending machine and so on. To be precise, 20,961 germs per square inch, just in the average office, including viruses and bacteria that can survive for nearly 48 hours in the open air. Phones and keyboards are the festering center of transmission, and how often do you touch your phone or use your keyboard every day? Eighty percent of communicable diseases are transmitted by touch, so it should be an easy decision to get on the handwashing awareness train. Caregivers and home care aides know that proper handwashing technique is crucial to keeping loved ones healthy and happy. Washing, sanitizing and drying consistently and thoroughly is the only way to stay healthy all year long.